Because I haven’t been posting here much, here’s just a quick reminder that I’ve been constantly updating the Science & Astronomy Hangouts Schedule on the original post from August and lonks to many previous hangouts are still archived there. You can also join the WSH Crew Google+ Community (named for the Weekly Space Hangout) where this post is also available plus a Google Calendar which we keep updated with all the interesting hangouts. The WSH Crew Community has been growing a lot recently and if you’re interested what’s new in space and astronomy you might feel right at home there. It’s much smaller than the big Space Community on Google+ and relatively low-noise, but filled with a great group of people who have been following and supporting what CosmoQuest, Universe Today & Co are doing for a long time. Some of the journalists and scientists involved in the Weekly Space Hangout have also joined and recently hangout organizer and host Fraser Cain has asked the community to contribute news stories to the hangout by posting them in the news section. This has been really popular and successful in the last couple of hangouts, making themeven more lively than usual in the last half. So you can join in and be a part of it if you want! The CosmoQuest 36-hour Hangoutathon is over now, but it has been extended into a 36-day fundraiser marathon, so you can still donate to make citizen science possible. If you want to find out how awesome this whole weekend was, you can either watch all 36 hours back to back on Youtube or if you want to jump to a special segment, I have again prepared an index of the uncut, raw footage to make navigating around a little easier. This is just a preliminary index I made without direct input from the CosmoQuest folks, but I know they are going to appreciate it and I hope it will get even more people interested in these amazing citizen science projects. 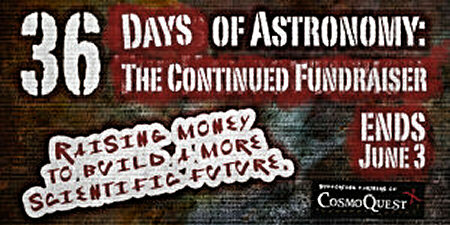 So go watch the science, the astronomy, the fun and the crazyness of 36 hours non-stop fundraising! The CosmoQuest 2014 Hangoutathon is coming! It’s less than 24 hours until the 2014 CosmoQuest Hangoutathon begins! Are you ready? Have you already donated or do you want to? It’s starting on 5pm CEST or 11am EDT on Saturday! Click on the image to go to the event page where all the information, schedule and video links will appear and also keep an eye on the CosmoQuest page on Google+, the CosmoQuest main website and their Twitter stream, where right now an hourly tweetdown to the Hangoutathon is happening! This just came in as I was finishing the article: Pamela Gay has recorded a short introduction about the preparations for the Hangoutathon and maybe there will be a timelapse of her attic being turned into a film studio later! • The schedule of the Hangoutathon is available here now! • Another video message from Pamela Gay from this morning. Update from Sunday: The Hangoutathon is now in hour 23 and the donations are at over $17.000 – that is only $3000 away from last years end result! It’s been absolutely fascinating with lots of fun and interesting guests! It’ll be going on until 5am CEST, which means I sadly won’t be able to see the finale live, but I’ll be writing something tomorrow about it. Update from Monday: Over $24.000 have been donated until the the end of the Hangoutathon, which is absolutely amazing! While this was still short of the $36k goal, I think it is still a rousing success for CosmoQuest and shows that there are a lot of people out there who genuinely care about the future of science and education. The show – and that’s what it really was – has been utterly amazing and it was pure joy to see the CosmoQuest folks and their friends and collaborators put on such a great effort to ensure that their project is going to survive. And they will make it! You can watch the whole Hangoutathon in this (unofficial) playlist and I’m going to make a complete index again over the course of this week. Go watch if you haven’t already and you can still donate, because the 36-hour hangoutathon has been extended into a 36-day fundraising effort! Update from Wednesday: The Hangoutathon Youtube Index is now ready! • Follow CosmoQuest on Google+, Twitter and Facebook! And I will close this post with a variation of what I wrote last year: While the Hangoutathon is not a pay-per-view event and watching is free, the whole reason for this amazing event is to raise money for CosmoQuest. So if you like what they are doing and care about science and astronomy education not only in the USA but worldwide, please consider making a donation – I’m sure that even small amounts are going to help. I will unfortunately not be able to contribute money this year, but if you are in the same situation, you can always help to spread the word and, of course, do Citizen Science yourself! Map the Moon and More with CosmoQuest! 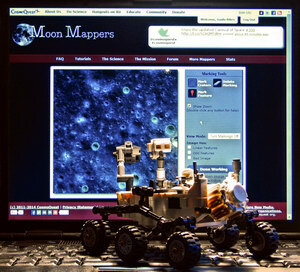 The Lego Curiosity Rover compells you – go map the Moon at CosmoQuest.org! Or you can go planet mapping on Mercury or asteroid mapping on Vesta! The mapping projects have always been a cornerstone of the citizen science projects of CosmoQuest, allowing everybody to contribute to science in an easy, instantly understandable way. Crowdsourcing the identification of craters and other unusual landmarks on the Moon, Mercury and Vesta is as easy as drawing a circle on the screen, but helps enormeously the scientific understanding of these surfaces. And the success is there – in March of this year, the Moon Mappers study was accepted in Icarus, a major peer-reviewed scientific journal, showing that crater identification by citizen scientists is practically as good as if experts were doing it. Two years after the beginning of CosmoQuest, the idea of creating a virtual research lab has now been scientifically proven to be extremely useful. But what does this really mean for the participating non-scientist? In preparation for the coming Hangoutathon fundraiser, a new series of articles headlined Your Science Results Explained is is giving the answers to this question, because the original paper is admittedly not so easy to understand for non-scientists. But leave it to CosmoQuest to boil the publication down to a more easy level, because this is what they do best: making science accessible for everyone! To get started with the Moon-, Mercury- or Vesta-Mapping, all you need is to register for free on CosmoQuest.org – this login also works for their Forum as well – and start circling craters on the Mappers websites. You will be shown an introductory video guide the first time you log in so you know what to do, but all in all it’s fairly easy and fascinating as well, because you get to explore the surfaces in great detail and often see images nobody has ever closely looked at before. The mappers websites not only work on the desktop PC, but also on tablets, although with some reservations – I had tested them on several different Android browsers recently and only Dolphin was able to render the Mappers flawlessy for some reason, so I can really recommend it for crater-mapping. Drawing the circles on the tablet is a bit tricky especially on small display sizes, but even on 7″ devices it works well especially if you can use a stylus. There is also a free Android app called Moon Mappers Crater Decay from CosmoQuest which lets you grade crater images on their level of decay. And you can also buy their educational game Earth or Not Earth for $1.99 (or €1.49 if you’re in Europe) with the proceeds going to CosmoQuest to fund their programmers – the app is also available for iOS devices now. Even if you don’t want to play it, it’s a great way to make a micro-donation! 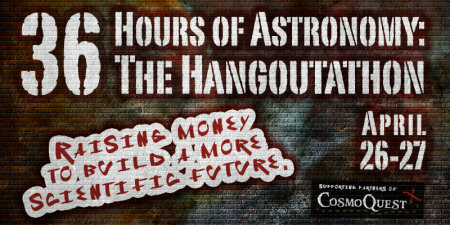 Remember when CosmoQuest held a 32 hour marathon Google+ fundraiser hangout back in June 2013? It’s going to happen again this weekend on Saturday, April 26th beginning at 11am EDT / 5pm CEST and this time it will last a full 36 hours. While the previous Hangoutathon was absolutely amazing and a big success, CosmoQuest is always in need of donations because of the still very dire funding situation. So, for the sake of the future of science and astronomy, the whole CosmoQuest team and their friends and guests are going to do a whole new mega-show to inspire everyone to contribute. I will post another announcement when there are more details, but the reason for this article is actually last year’s Hangoutathon. The whole 32-hour hangout is available in eight parts on Youtube, but due to the size of the event it has not yet been cut into separate parts. At the end of last year, I went through the Youtube videos and prepared an index table with the help of the schedule to provide links to the starting times of the separate events. Until now, I had not posted the index publicly, but now it’s the best chance to promote the next Hangoutathon with it, so here it is. Some excerpts are also being posted right now on the CosmoQuest stream on Google+ and I will add these to the index when they appear. Go watch some recorded science and then participate live this weekend! 25.05.: Happy Towel Day 2017!